Yesterday I wrote about how I was ending the J-Fro before the intended goal of my 40th birthday at the end of May. I was hoping that Tammy wouldn’t find out because I wanted to surprise her with the “new” me, especially considering how much she disliked the J-Fro’d version. 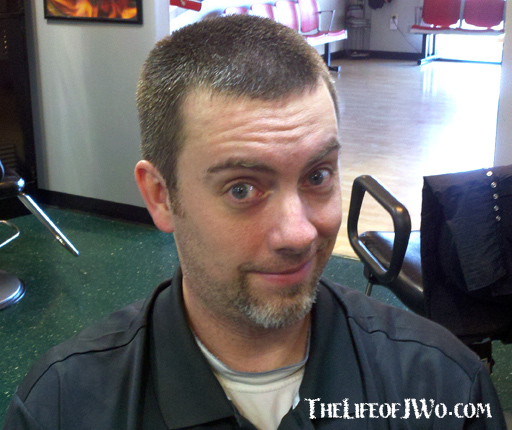 So, I stopped a the Sport Clips on my way home (sorry Kristan and the Salon Mackk girls) to get my hair did. 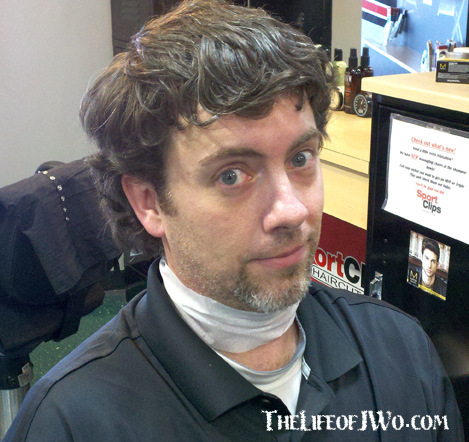 When I reminded Tammy that I was stopping to “get my hair trimmed,” she said she couldn’t wait to see it. Me: (thinking) She knows. She would never have said she was excited to see my hair if she just thought I was getting it trimmed. I had gone out of my way to make sure yesterday’s post didn’t get released to Facebook or Twitter until AFTER I got home, so I figured she must have been checking the blog. I was disappointed that she knew, but I didn’t let on just in case I was wrong. I walked into Sport Clips and was seated immediately by Christian who asked what I was getting done today. Me: Take it off. All of it. Use a four [guard] on the top and a three on the sides. Christian: Oh wow. All of it? Everything? Me: Yeah, I’m tired of it so it’s time for it to go. We talked a little more as she was searching around for the right guard for her clippers. Christian: How long have you been growing it? Me: Since October. I was going to grow it out for my 40th birthday at the end of May, just to show that I could do it and because a lot of my friends that age are going bald. Christian: Well, you definitely don’t have to worry about that happening. You’ve got a LOT of hair. Me: I know, right? It’s gonna look like you sheared a goat in here when you get done with me. She laughed and began running the clippers through my mane. My hair was so thick that it bogged down the shears at least 3 times, I kid you not. I would laugh as large chunks of hair fell to the floor or when they would hang off the side of my head while Christian sheared off everything else. It didn’t take long for me to feel a strange sensation on my head, one that I haven’t felt it quite some time. It was cool air…actually reaching my scalp. She finished my hair, washed and dried what was left and sent me on my way. I texted Tammy that I was almost home. Tammy: (via text) Ok excited to see. She HAD to know because there’s NO WAY she’s excited to see my hair, even after a trim. It wasn’t until I walked into the apartment and took off my hat that I realized she did NOT know I was ditching the J-Fro. She said there with her mouth open, not really saying much of anything at first. Tammy: It’s REALLY short. I wasn’t expecting that AT ALL. Me: So you didn’t know? Tammy: No. I thought you were getting it trimmed a little, but not like that. Me: I just got tired of it. Tammy: I can see that. It’s just REALLY short. Me: It’s no shorter than it used to be. Tammy: I guess it’s just been so long. I’ll just have to get used to looking at you again. I have to admit it was a little weird looking at myself in the mirror and not seeing the J-Fro anymore, but those thoughts didn’t last long. Especially this morning when I slept an extra 10 minutes, was still out of the shower and dressed earlier than I had been the entire time we’ve been in Memphis. My new look even caught a few of my coworkers off guard. My boss said he had to do a double-take when I walked by because he wasn’t sure who it was. I’m definitely enjoying how the new look, which actually is my old/original look, feels. It’s as if the weight of the world my hair is off my shoulders head. I really wish I had thought to take a picture of the mess that was left on the floor. Sorry Christian. Gallery | This entry was posted in Daily Life and tagged beauty, daily life, Hair, Hair Care, hairc, health, humor, Postaweek2013, Tammy. Bookmark the permalink. I figured Tammy would have done the happy dance!! She just sat there staring at me. I think she was too stunned to move. You look great! I like you with short hair. I’ll be forty next month too. I am not sure how I feel about it. I am not sad by any means but I have been trying not to think about it. Don’t let it bother it. I’ve thought about it and embraced it. I know I can do the same things that I used to, but it doesn’t mean I can try!! Thanks for the compliment and cheers to being forty in May!! I agree with Tammy, it’s MUCH better! Looks AOK… I am sure Dad would approve.. Remembering how he liked well trimmed hair..
Much better to see those baby blues now that all the curls are gone.